I have been eying skinny cheetah prints jeans for more then a year, but I couldn't summon up one’s courage and buy them. When they was gone I deeply regretted it and instead bought tie dye biker jeans (you can see them here). I was excited to see them back in store and even if they wasn't trendy I would bought them anyway. So much I regretted not buying them. This time pairing them with my super chunky and cosy, red jumper. It was pretty windy day. Looking pretty as always! Love the sweater! that red is so ravishing on you!! 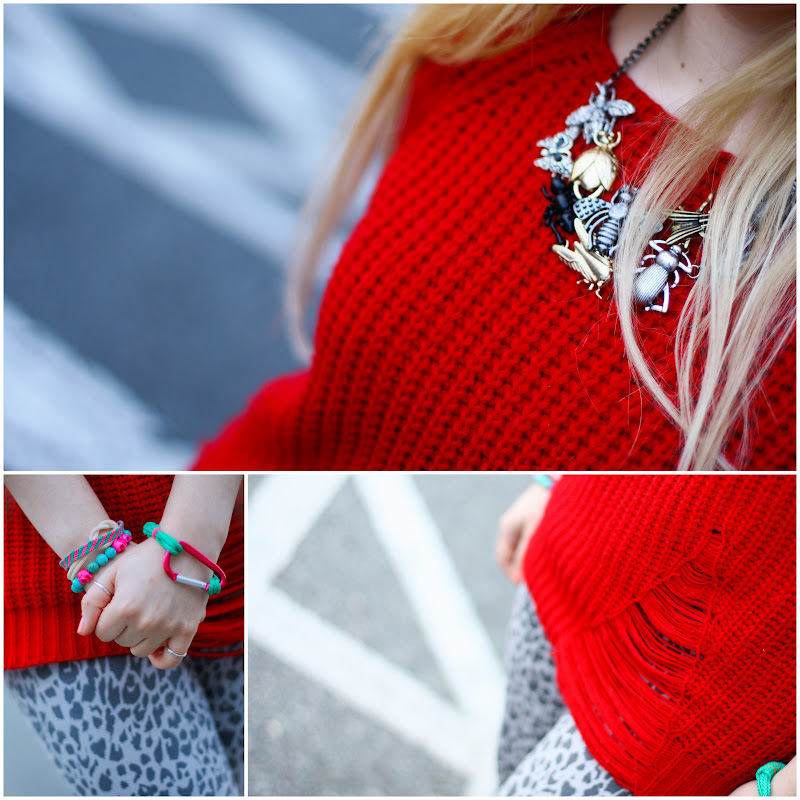 I love how you paired it with the cheetah print skinnies..and added pops of fun color with your bracelets!!! I love your jeans!!!! The whole outfit is fab!!! I love these jeans on you!!! They look fabulous. You did a great job in combining the cheetah jeans wih the red sweater!! I love this color on you! El sweater es monísimo, muy original y con un color precioso ! I never thought i'd like animal print jeans but I really do! Great necklace too. i love the jeans..you look fab! Oh wow I love how the red looks with your skinny jeans! Lovely outfit! Girl, you better WERQ! This outfit is absolutely FIERCE! Awesome jeans love the look! Haven't found my cheetah print jeans as yet... finding finding!!! Cute look! 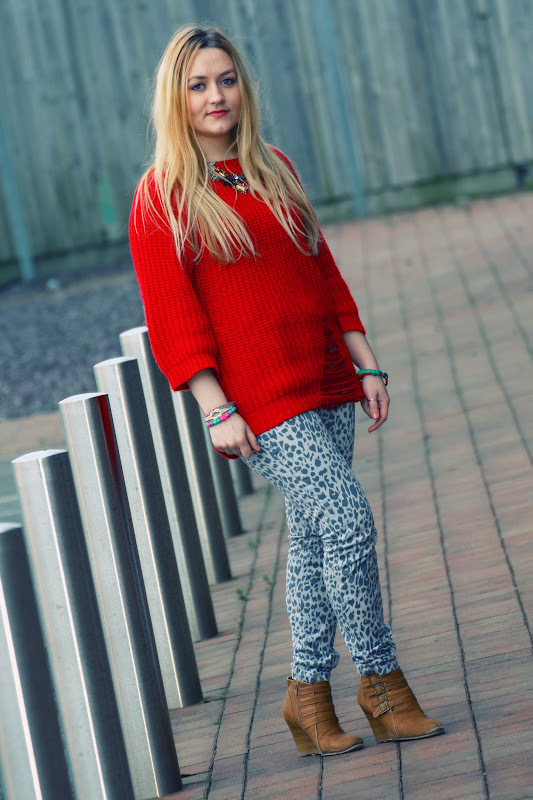 Love the jeans with the bold, red sweater. I love the combo of red and powder blue to begin with, but this is made even better with the leopard print! Great look love. amazing color on you. 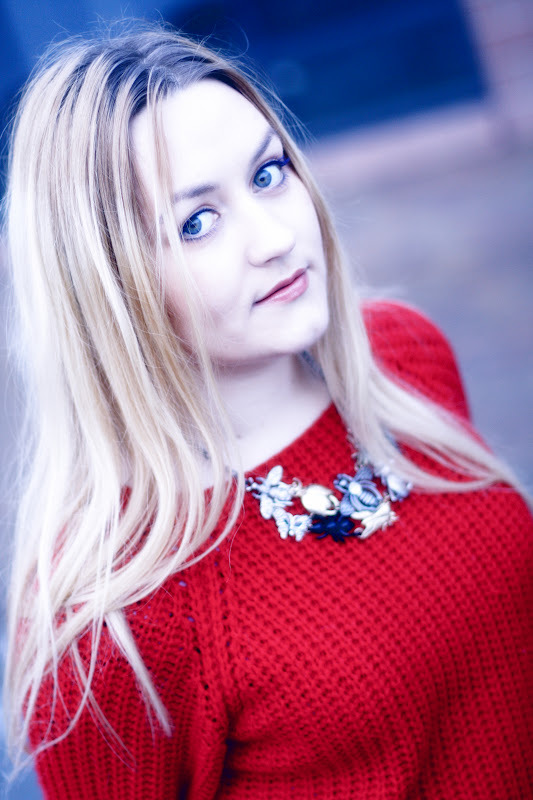 love the red chunky sweater with hayed detail. it would be lovely to follow each other and get inspired! i always am in love with the knit! If there is anyone who could pull off cheetah print pants with style, it's you, Ramona! I would never be brave enough to don a pair of pants like these, but on you - especially with your chunky red knit - they seem like the most natural choice in the world! Beautiful!